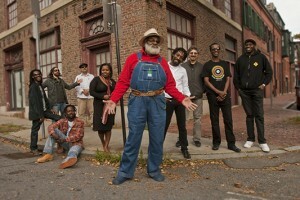 The Playing For Change touring band will be appearing at six Levitt locations across America. Co-founded by GRAMMY-winning producer and film director Mark Johnson and Raan Williams in 2004, Playing For Change was created from the belief that music has the power to break boundaries and overcome distances among people—regardless of their geographic, political, economic, spiritual or ideological backgrounds. Playing For Change began with a small film crew and a mobile recording studio. Its breakthrough moment came in 2008, when its video of musicians performing the song “Stand by Me” went viral. In it, musicians separated by thousands of miles across the world—in places like an L.A. street corner, Rio de Janeiro, African villages, even the Himalayan Mountains—were united through the shared experience of creating music. The video became an instant YouTube sensation, and to date, it’s been viewed 55 million times. It was the first of many “Songs Around the World” posted on YouTube by Playing For Change that have attracted viewers in the millions. From this online success, Playing For Change grew into a movement encompassing a nonprofit foundation that develops and operates music schools in five countries, including Nepal, South Africa, Ghana, Mali and Rwanda, as well as a touring band comprised of seasoned musicians from around the world performing a blend of World music traditions. Comprised of an international roster of acclaimed musicians from nine countries and representing four continents, Playing For Change possesses a unique, exhilarating sound that reflects its mission. The celebrated performers who make up Playing For Change hail from the Congo (Jason Tamba and Mermans Mosengo); New Orleans (street icon Grandpa Elliott); The Netherlands (Clarence Bekker); South Africa (Titi Tsira); Cuba (Orbe Ortiz); Israel (Tal Ben-Ari aka Tula); Italy (Roberto Luti); Los Angeles (Peter Bunetta); Japan (Keiko Komaki); and Zimbabwe (Louis Mhlanga). In the coming months, we will announce the concert dates for the inaugural Levitt National Tour, so stay tuned for further details! This entry was posted in Levitt in America, Levitt National Tour, News, The Levitt Effect and tagged Anne Pitts, Levitt Shell Memphis, Levitt Tour, Playing For Change, Raan Williams, Sharon Yazowski on October 31, 2013 by Vanessa Silberman.